While I would think most of you in Europe have finished eating for this evening there are still those in America who might get a bit hungry after this entry. Unfortunately for them I don't think they deliver from Islay to America just yet. Who is ‘they’ then? 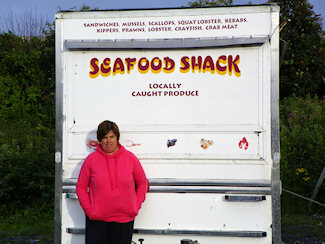 They are Ishbel and Frazer Aitken (you can see Ishbel in the picture in front of the trailer) and have recently launched their business processing and selling locally caught Islay seafood, mainly shellfish. They sell to local hotels and restaurants as well as to the public. In addition they attend various events with their trailer, I've just read in the Ileach that they will be on the Islay Show in August. 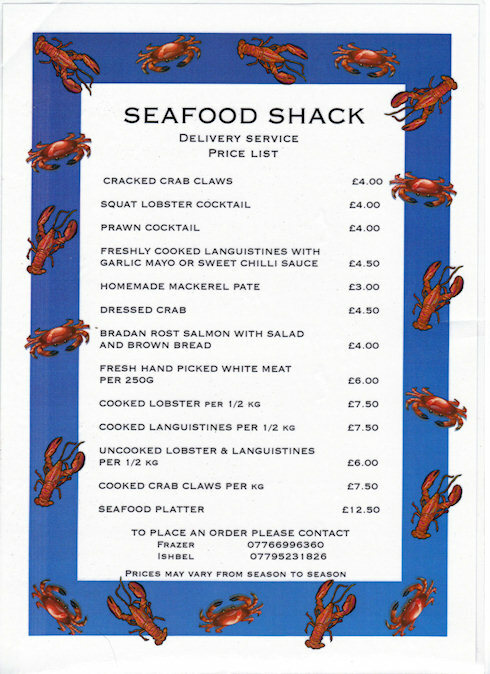 To my shame I have to admit I missed them during the Islay Beach Rugby tournament in June, but I will make sure I try their food during my next Islay visit. Looks good, doesn't it? Hungry yet?